In 1976 it seated 600 and was on films five nights a week, bingo for the other two. The stalls seating was removed in 1979 to allow for nightclub use, though films continued to be shown until 1989, with the last film possibly 'Batman'. It is currently a music venue/bar/club. The balcony is no longer open to the public, though some cinema seating remains. The projection box, complete with Kalee projectors still in situ is, unusually, at the rear of the stalls, not the rear of the balcony. 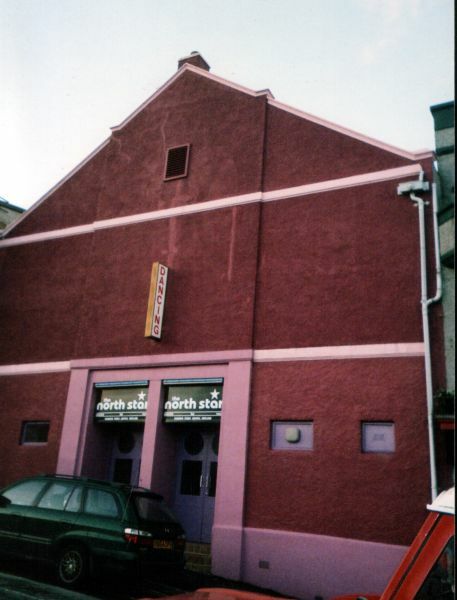 A selection of 1930s archive photos of the North Star as a cinema - including original interior and exterior shots, can be found on the Shetland Museum Photographic Archives page here. In particular, on the interior shots notice the projection portholes at the rear of the stalls, and the picture of the original projectors. Thanks to the manager of the North Star, Alan McCleod, for his time, enthusiasam and helpfulness!